Learn Robotics with Raspberry Pi brings beginners into robotics by focusing its robot-building projects around a $35 credit card-size Raspberry Pi microcomputer. 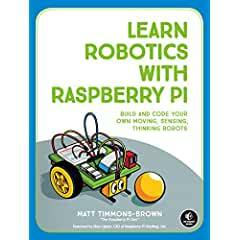 The book’s 19 year-old author, Matt Timmons-Brown, is also the creator of the world’s most popular Raspberry Pi YouTube channel (over 5 million views). He shows readers how to program their own complex robot from scratch while introducing them to computer science basics, electronics, and Python programming. Readers build a sophisticated two-wheeled robot that they customize, adding the ability to follow lines, see the world through sensors, and avoid obstacles. Detailed chapters on electronics basics help inexperienced makers quickly gain their footing in the robotics world. “Learn Robotics with Raspberry Pi provides a gentle introduction to this exciting field, building up from the simplest input and output examples to a robot which incorporates wireless control.” —Eben Upton, Founder of the Raspberry Pi Foundation. This guide to robotics promises to take readers from inexperienced makers to robot builders in a fun and affordable way. Now available in fine bookstores everywhere.